This software program is very easy to use with simple, intuitive and clear navigation, making learning an enjoyable and rewarding experience. You can used it by yourself as a personal study course, or use it to supplement any level of English language study. Guided assistance is offered in Indonesian in order to help make learning as easy possible. 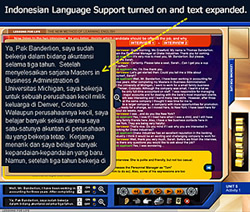 Full Indonesian translations are embedded within the software and can be turned on or off as an optional feature. 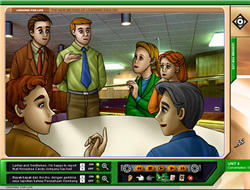 AudioMate offers: Conversations, Slow Down, Listening Comprehension Questions, Activities, Idioms Flashcards, Keywords and Phrases, Make it Personal. While most of the material is aimed at intermediate learners, there is plenty for elementary learners, especially in the earlier units. Advanced learners should find the later units especially helpful. By working through the activities, you will learn to use English with accuracy and confidence. Practical English Conversations consists of 3 levels of difficulty - Beginner, Intermediate and Advanced - and includes 300 conversations! 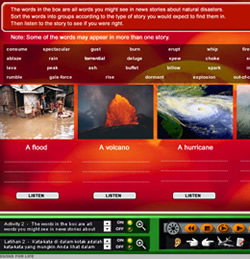 There are 4 interactive games in this program, designed to help you improve your memory, vocabulary and spelling skills. These games can be played many times, have many sub-levels, and always with different combinations and fresh challenges. AudioMate is designed to help you improve your fluency in English. AudioMate focuses on listening, speaking, and pronunciation skill. We present all our subjects through natural conversations, spoken by different people so that you can practice English the way it is really spoken. We want to help you understand what you hear and speak naturally and correctly on a wide range of subjects. Keywords and Phrases sections allow you to practice your pronunciation and perfect your accent. Beginner Level AudioMate includes full Indonesian Language Support. 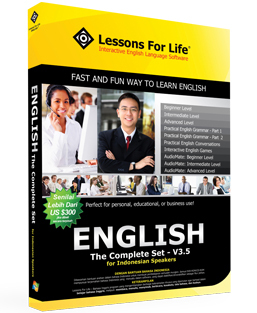 You will hear the English audio lessons first, followed by Indonesian language translations. 800x600 resolution; sound card; USB drive; 500MB free hard disk space when disc used or 3GB hard drive for digital download or using from hard drive.